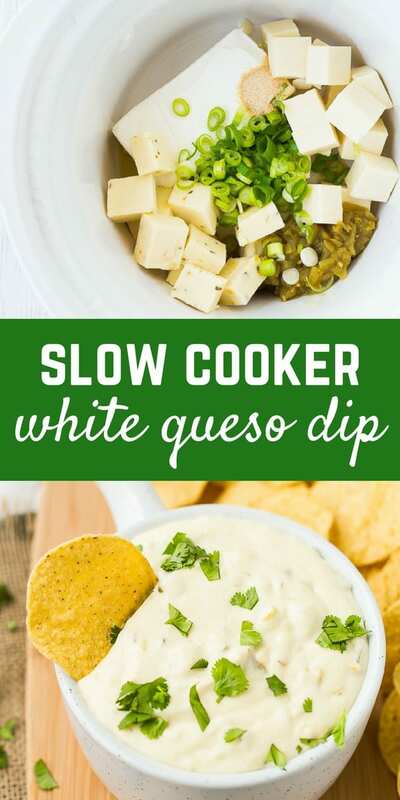 Queso Blanco in the Slow Cooker is easy – easy crockpot queso! Velveeta-free, and you will not be able to stop dipping chips in it! Queso dip is hands-down one of my biggest weaknesses. I mean, who can resist melty cheese on a salty chip? 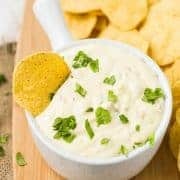 This white queso is irresistible, just like my Mexican Spinach Dip or the beautifully colored healthy queso dip with butternut squash. The subtly sweet flavor of that one is to die for…have you guys tried it yet? This queso blanco is perfect for upcoming Cinco de Mayo festivities. Pop all the ingredients in your slow cooker, and three to four hours later, you’re ready to start dipping. Okay, I may have sampled a few bites before it was even completely done. Quality control! I purposely stayed away from Velvetta cheese in this recipe and achieved a nice smooth texture with low, slow heat and a mixture of cheeses with cream cheese and milk to keep this nice and dipable. 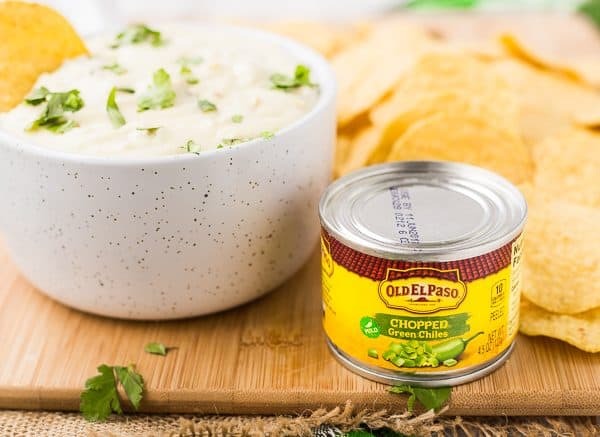 Old El Paso Mild Green Chiles give this dip great flavor without overwhelming you with spice. I added a little extra spice with Pepper Jack cheese but kept it tame by using half plain Monterey Jack cheese. If you like it on the spicier side, go for all Pepper Jack instead of 50/50 mix. The rich flavors of the cheese are brightened up with green onions and cilantro. PS: If you really want to get serious with your dipping, which I fully support, try cutting Old El Paso Mini Taco Boats in half and then spritzing them with olive oil and crisping them up in a 350 degree oven for about 7-10 minutes or until golden brown. They’ll make perfect little scoops for as much queso as your heart desires! How about some great tacos to eat with this queso blanco! 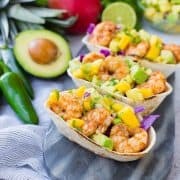 Try cauliflower tacos or shrimp tacos! 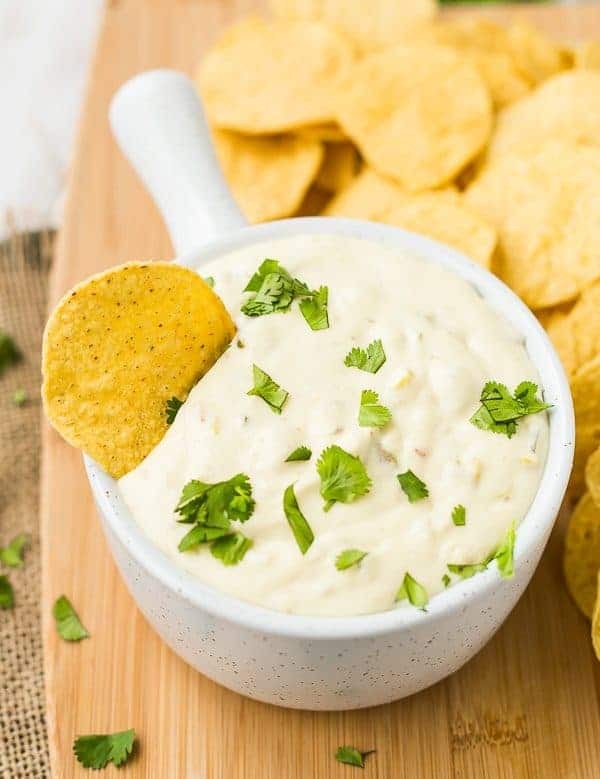 White Queso in the Slow Cooker is easy, Velveeta-free, and you will not be able to stop dipping chips in it! 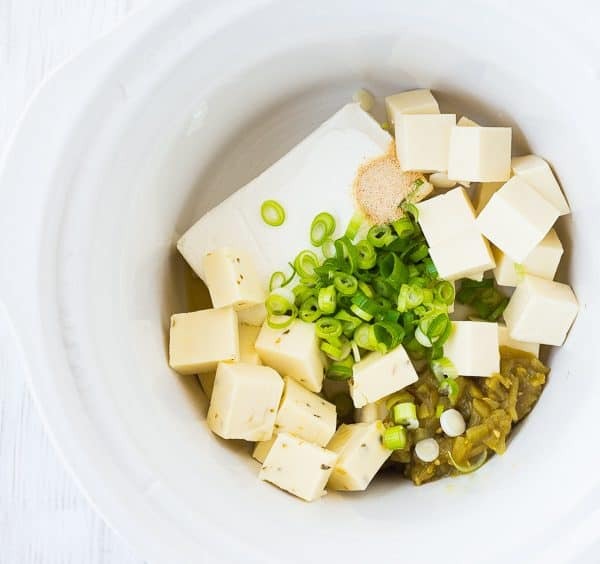 In a small to medium size slow cooker, combine all ingredients. Cover and cook on low for four hours or until everything is melted, stirring to combine. Turn to low until ready to serve (and even while serving if desired). Garnish with fresh cilantro if desired and serve with chips or toasted mini taco boat halves. Note: If your slow cooker runs hot, you may want to turn this down to warm after two hours. Verdict: I couldn’t stop eating this queso blanco! Husband’s take: He loved this slow cooker dip and definitely ate his fair share. So did my dad. We’ll be making this one frequently! The Queso came out fantastic when I made. Such a simple recipe I was pleasantly surprised by how well it turned out. I added jalapeño as well as some dried spicy peppers from last season and that gave it the extra slice I was looking for. Thanks for the awesome recipe! So glad you like this recipe! Thanks for taking the time to come back and leave a comment! I’m not sure what I didn’t wrong but I made this as directed and it had a very grainy texture…. the flavor was good but the texture did me in, it was almost the consistency of blended potato soup?? Any idea what might have went wrong? I planned to make this for a women’s retreat at our church, so thankful I did a trial run or it would have been a disaster. It could be that your slow cooker overcooked it? Did you have it on warm? You should be able to serve 10 as an appetizer – are you having other apps too? I am keeping the crock pot on low, but the cheese sauce is still turning out gritty, any ideas what could be causing this? I haven’t experienced that – maybe trying turning your crockpot to warm…some run pretty hot. 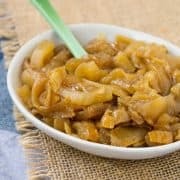 Would this recipe fit in a 2 quart crockpot? thanks! I believe it will! I hope you enjoy! Oh I’m so happy to hear that! I am loving the addition of hamburger! Thanks for taking the time to come back and leave a comment! Great queso! I didn’t have pepper jack cheese so used 2 monterey jacks instead. Compensated for the spice by adding 1-2T canned chipotle peppers (in adobo sauce), diced. This gave a delicious depth of smoky flavor & a good amount of spice. Easy to adjust to more spice with more chipotles, if desired. Didn’t have 4 hours. I cut up the cheeses into 1″-ish cubes in a large glass mixing bowl then microwaved at 40% power for 4 minutes. Poured all into my pre-heated 1-quart crock. Was ready in 2.5 hours. Loved it. So happy you liked this! Thanks for taking the time to come back and leave a comment with your tips! I thought this would be a flop. Seemed too simple. But, oh my, was it good! Restaurant-quality, in my opinion. Thank you for sharing! This sounds so amazing and easy. I really appreciate that there isn’t any Velveeta used because I am one of those rare people that actually HATE the stuff with a passion. Perfect! 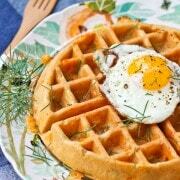 I hope you love this recipe! How big does the crock pot need to be for this recipe? I use a 5 quart. I’m ALL about queso dip…. and doesn’t white queso somehow seem healthier than yellow? Whatever I have to tell myself to sit on the couch and eat this with a spoon, right? !